This is the 2nd book in the Chi-obaa series. 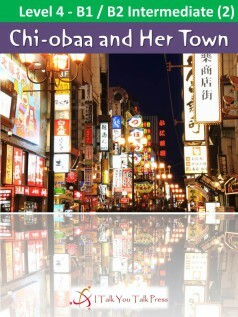 The first book is “Chi-obaa and Friends”. Here are two more stories from Nakashige-cho. In the first story, a very important person asks Chi-obaa for help. He needs some information and he believes Chi-obaa is the best person to get it. She travels to Osaka and goes undercover in a bar in search of the truth. In the second story, someone has stolen Hatsuko’s tricycle. Chi-obaa, Hanae and Hatsuko try to find the thief. They uncover problems that must be solved and crimes that must be prevented. As always, their methods are unique, but will they be successful?